If you found this exercise useful and you’d like to say thanks you can click here to make a contribution. Thanks for trying our exercises! This exercise is provided to allow potential course delegates to choose the correct Wise Owl Microsoft training course, and may not be reproduced in whole or in part in any format without the prior written consent of Wise Owl. The answer to the exercise will be included and explained if you attend the relevant Wise Owl course (sadly, only in the UK for now). Before you can do this exercise, you'll need to download and unzip this file (if you have any problems doing this, click here for help). You need a minimum screen resolution of about 700 pixels width to see our exercises. This is because they contain diagrams and tables which would not be viewable easily on a mobile phone or small laptop. Please use a larger tablet, notebook or desktop computer, or change your screen resolution settings. Uncle Bulgaria wants all reports to start life like this. By default all reports have the two logos shown, and the date of printing. 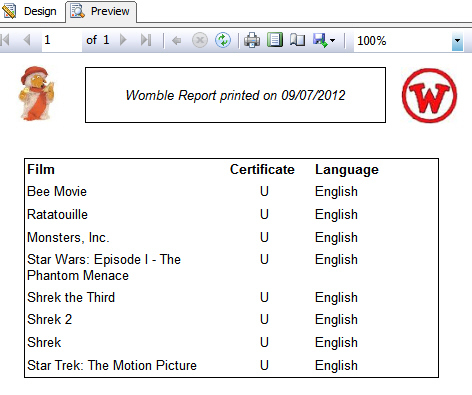 include a default dataset showing all English language U certificate films (Wombles can be parochial). 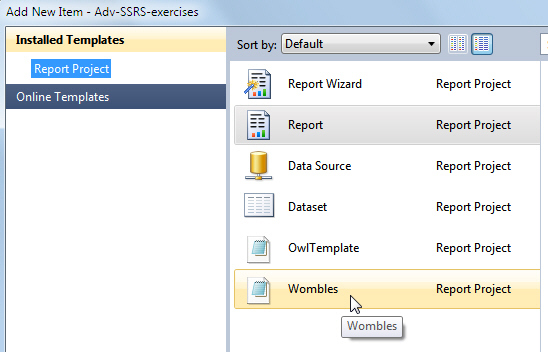 A report based on the Wombles template, listing out all of the films in the default dataset. Close all of your reports!